Although we don’t get ice and freezing temperatures often in Georgia, you still need to protect your property for the occasions that we do. There are serious hidden dangers that come along with ice and extremely cold weather. Here are a few dangers you should be aware of and protect your property against. FREEZING PIPES - To help prevent frozen pipes in the winter, insulate your pipes as fully as possible. When temps get really cold you may even want to keep your faucets and spouts running at a drip. 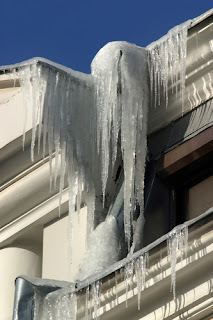 ICE ON ROOF – Ice and snow are heavy. This weight can cause damage or even collapse when on your roof. Roof rakes can be helpful in removing ice or snow build up on your roof. If the build up is significant or hard to reach, contact a professional company like ours. DRAINAGE – Even after the coldest temperatures, eventually everything thaws out. This is why it is important to have clear gutters, drains and downspouts to handle all of the excessive drainage.